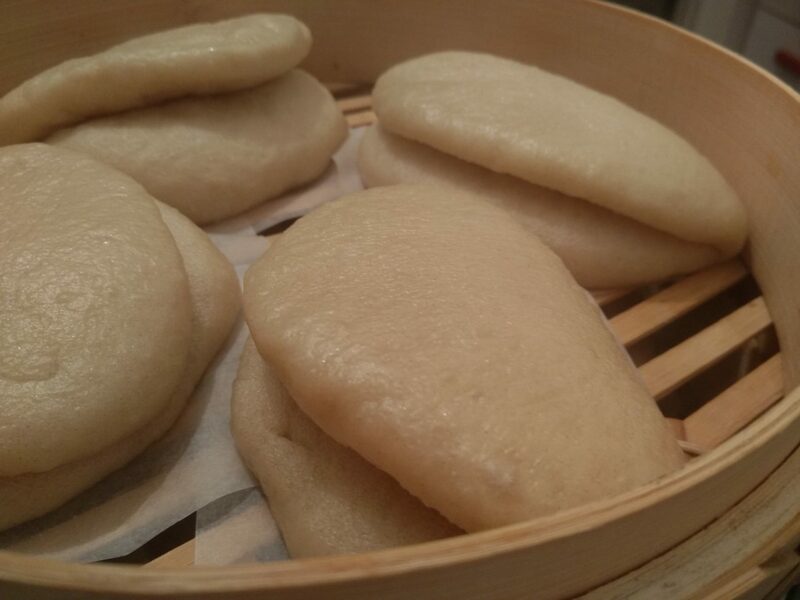 Chinese steamed buns are a lot of fun and have great taste and texture. I was first introduced to the Chinese steamed buns a few years ago when I had a great Chinese style duck in a steamed bun and it had a very unique and delicate flavor. Today, I am making these great buns on a regular basis, first because the process is very easy and simple, and second, these buns takes only a few minutes to be ready, crazy isn’t it? 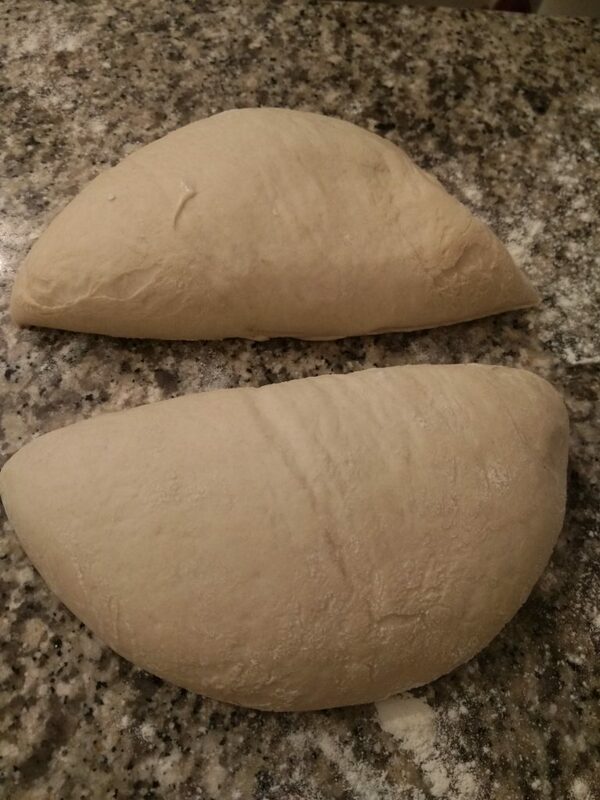 I make the fold over buns with the pocket which allows you to fill it with whatever you have on your mind, but it’s possible to make a round bun shape and cut it in the middle just like bread. Beginning is always with the dough, it is simple however there are a few points to remember when making it and a time frame to keep in order for them to succeed. We start by adding yeast to warm water, oil and sugar in order to feed the yeast and wake them up. Only after I see small bubbles (within a few minutes) we can add the rest of the ingredients, baking powder, flour and salt. 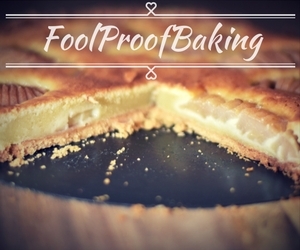 We knead the dough with a stand mixer fitted with the hook attachment, try to give it at least 3-5 minutes of kneading. 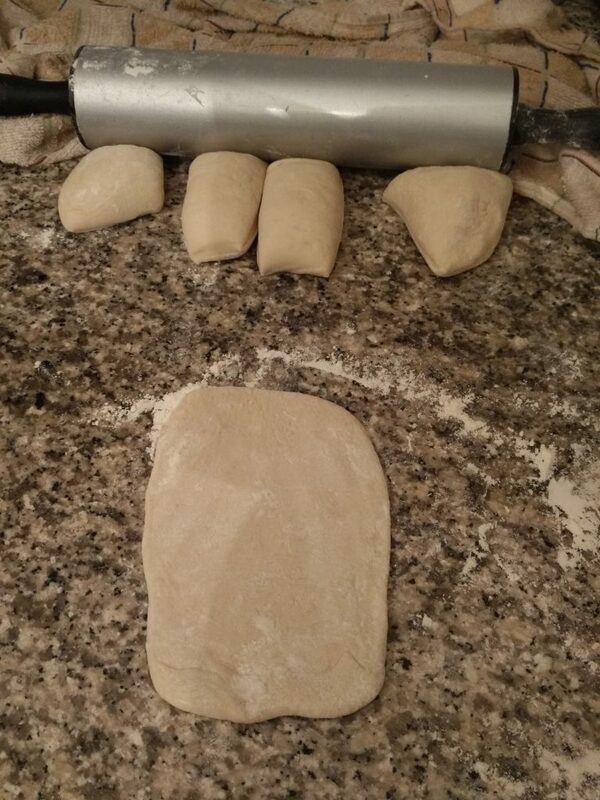 I use a regular all-purpose flour for these buns. 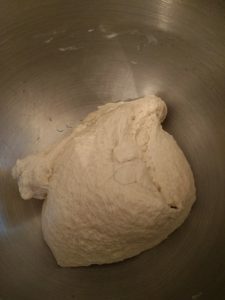 I don’t want high glutamic flour here, I want a chewy but firm buns that will not be stretchy and flexible like the texture we look for in bread for example. 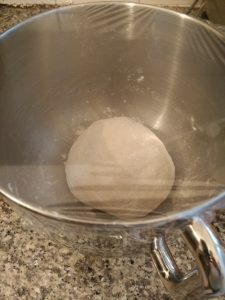 The average amount of all-purpose flour is 9-12% protein (also known as Gluten), bread flour has about 13-14% protein, this is crucial when making a stretched dough like bread, pizza, pasta etc. Cake flour has 7-9% protein so it can be great for the Chinese steamed buns dough as well, but really, all-purpose flour is just as good. After the dough had formed into a shiny sticky ball, I take it to the counter for a final hand kneading . 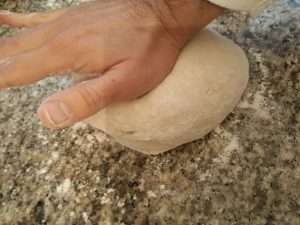 So, get to work, flour a work surface and knead the dough for at least 2-4 minutes, we will end up with a flexible smooth dough. Place the dough back in the mixer bowl and cover with a plastic wrap for 2 hours, we want the dough to double its size. 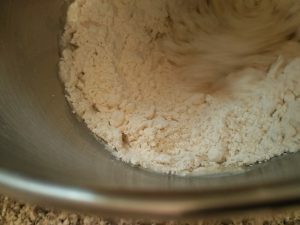 After the dough had rested for about 2 hours and doubled its size, on a floured working counter, divide it into two equal parts. 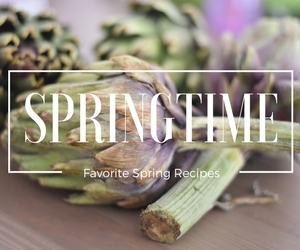 Roll each half into a log shape and cut into 6-5 pieces each. 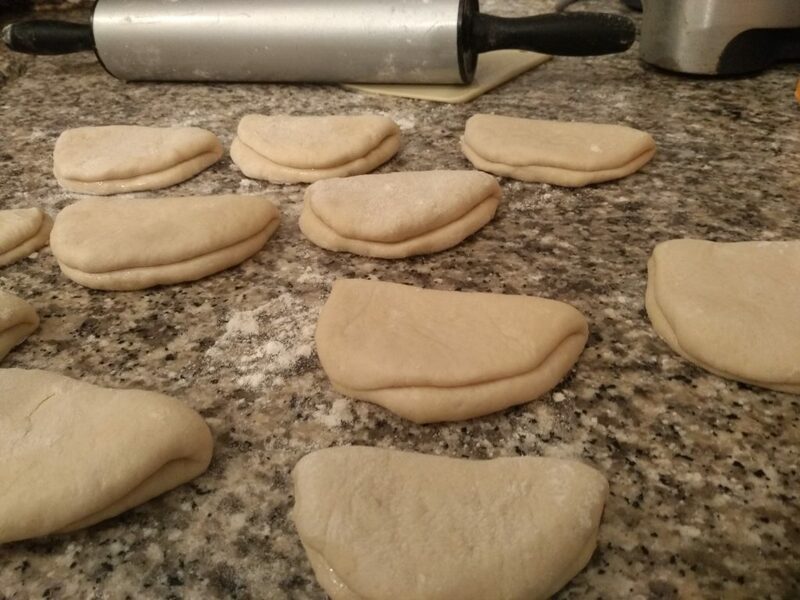 Form each small bun into a round ball shape and flatten it with your rolling pin into a small elliptic shape. 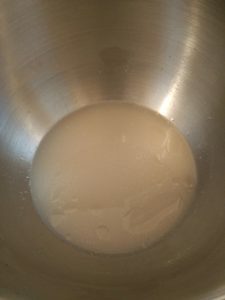 Brush the surface of the Chinese steamed buns with some regular cooking oil and fold into half pressing the bun after folded so it will not open during the steaming process. *** The cooking oil will allow us to open the buns easily without fighting for spreading the top and the bottom of the bun. Place the buns in the steamer for a final rest of 10 minutes before turning on the heat below the steamer, it’s very important to place parchment paper little squares below the buns so it won’t stick. 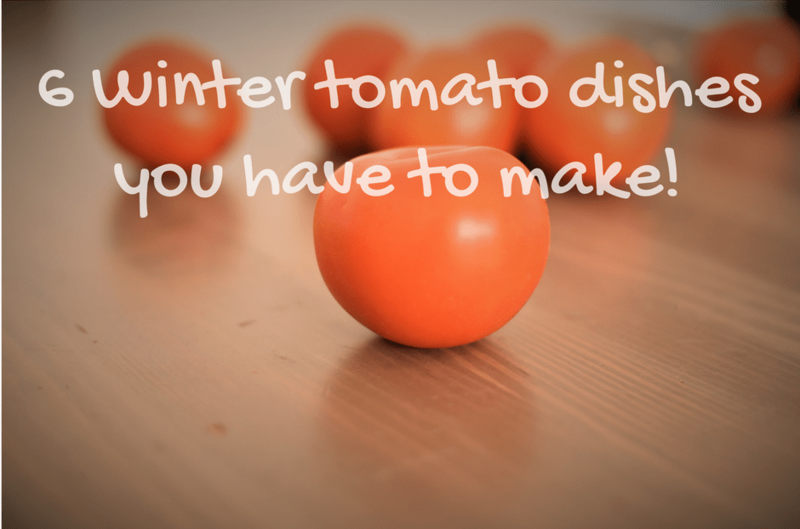 After the 10-minute rest, fill a large pot with water and place over high heat, bring the water into a simmer. Steam the buns for about 5 minutes after the water had reached boiling point. It is not necessary to wait until the water reach boiling point and then place the steamer, it’s actually better that the buns will gradually reach high heat, this will ensure that the buns will not lose its size after the steaming. 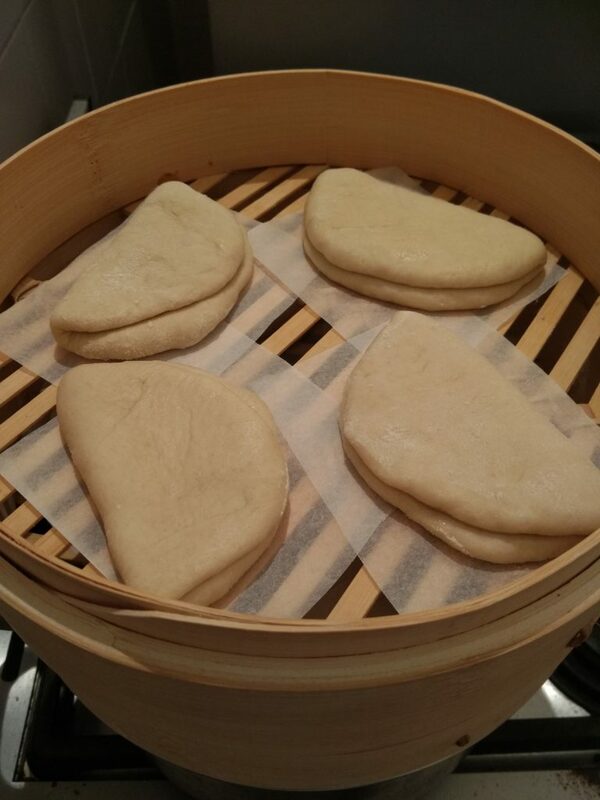 When the buns are ready, turn the heat off and leave the buns for 2 more minutes inside the steamer, we want that the temperature gradually reduced so we will not experience deflate of the Chinese steamed buns.